This bikini was worn by Carmen Electra in the “Iconic Beauty” poster that appeared in the 2010 motion picture comedy “Barry Munday” starring Patrick Wilson. The outfit consists of a gold metallic faux-alligator string bikini by Beach Bunny, a pair of hammered gold metal hoop earrings, and a pair of gold “peep-toe” stiletto heels by Aldo. 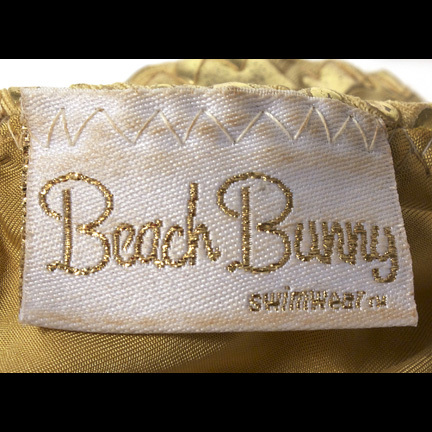 The original costumer’s tag is attached with film title, working character title “Gorgeous Woman” (changed to “Iconic Beauty” prior to release), handwritten actress name “Carmen Electra”, production information, and handwritten costume description on the back. Ms. Electra wore the outfit in the photo shoot for the poster seen in the film. The poster was first seen hanging above the TV in “Barry Munday’s” (Wilson’s) apartment and then shown several more times in later scenes before the former womanizer replaces it with a framed picture of his baby’s sonogram. The actress also appeared wearing the outfit in a scene that was cut from the film. “Barry Munday” featured an all-star cast including Chloe Sevigny, Cybil Shepherd, Billy Dee Williams, Malcolm McDowell, and Kyle Gass (of Tenacious D). The film featured a rare comedic turn for lead actor Patrick Wilson, better known for his dramatic roles in such films as “Hard Candy” and “Watchmen”. The items are in excellent condition and are accompanied by a letter of authenticity.